or How I learned to stop worrying and love the Germans. Sometimes I wonder if Germans hate warmth. My first winter in Germany was the coldest in my life. Even though I had grown up at the foot of the Rocky Mountains, I had no idea the world could even get that cold. Or maybe I just had the wrong jacket. Though come to think of it, of course I had the wrong jacket. In German cold you don’t need a jacket, you need an anorak. You don’t just need clothing for that kind of cold, you need a solution. And it seemed especially cold when I walked the kilometer to Gymnasium every morning in my wrong jacket. By the time I got there I was freezing. I was so cold, I’m certain several of my relatives were cold as well. I would get to school and walk up the steps into my first period philosophy class and be greeted by the warmest, snuggliest heat I had ever felt. The warmth of a room that has been heated all night while no one was in it, as if it were just waiting for me. And I would get more than just warm. I would get relief. The world was going to be OK.
That is, until Thilo walked into that room. Thilo is pretty much the German version of Chad and everyone suffers when Chad or Thilo is around. They are popular, the Thilos and Chads. But they are so often misguided. Thilo never felt welcomed by that warm room. Thilo felt offended. And with that he would throw every window in the room open. Other students would file in and no one seemed happy until the temperature of the room matched that of Little Siberia outside. Apparently only then was the air repaired. They would close the windows and I would once again freeze. As would my relatives. 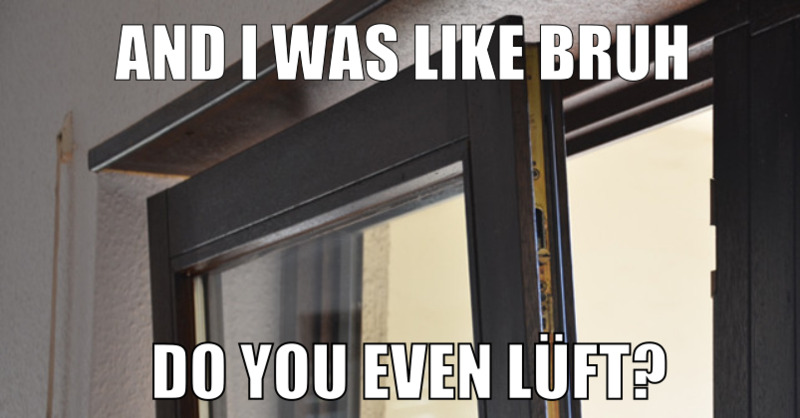 Germans seem to often get angry at warm air. They resolve the situation through something called Stossluften (freeze everyone in the room). It involves exchanging all of the warm air for freezing air. Apparently freezing air that heats slowly while you are in it is no longer offensive. I don’t exactly understand the science. I’ve encountered this in my kids’ schools, offices where I’ve worked and even from maids in hotel rooms but, oddly, never in a smoke-filled bar. No, that air is not offensive, just carcinogenic. A German once told me warm air lacks oxygen and cannot sustain life. You know, like Mars. Even in rooms that have been empty for 12 hours. Again, I’m unclear of the science. January is almost over. Stay warm. Thanks for Stosslüften. I didn’t know it is so german and so weird to other earthlings. You make me laugh and i can hear your voice while reading it. Schön wie du deine Vergangenheit aufarbeitest. Get notifications of new posts by email. And no spam. Ever.